Our mission is to develop leaders for our nation's Air Force. We emphasize development of the whole person (academics, physical fitness, and leadership). We expect to continue growing and become one of the largest and best AFROTC detachments in the nation, building upon the Air Force core values of "Integrity, Service, and Excellence." 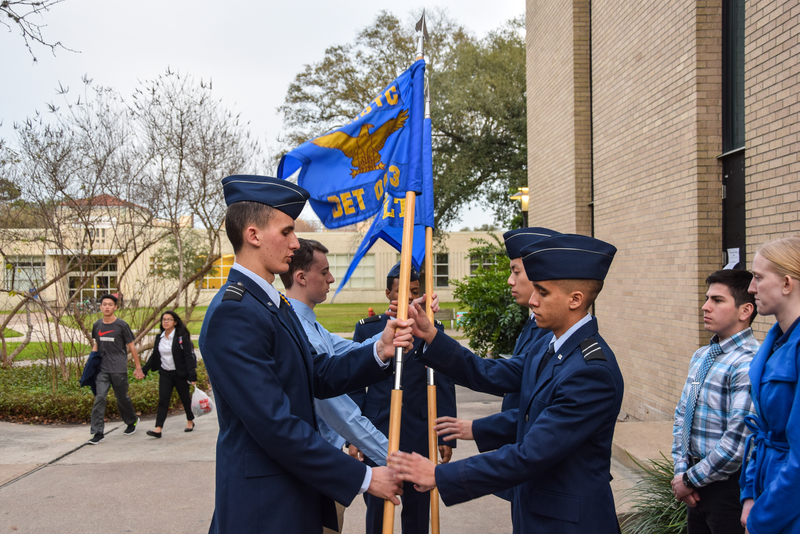 Students from Rice University and 14 other colleges and universities in the greater Houston area participate in Air Force ROTC at the University of Houston. To join the Air Force ROTC program, all you have to do is sign up for the class (search for “AFSC” in Rice’s online course catalog) the same way you would for all of your other classes. The offices for AFROTC Det 003 are located on the UH Main campus in the Susanna Garrison Gymnasium. Air Force ROTC prepares college students for careers as Air Force Officers through a college level curriculum. In short, you will continue to work towards a college major of your choice at your current school, and joining our program will add AFROTC classes to your curriculum. When you graduate with your bachelor’s degree, you will also become an active duty commissioned officer in the United States Air Force. Air Force ROTC offers a Three or Four-Year Program. The program begins with the General Military Course. As a freshman or sophomore, you will normally attend one hour of class and two hours of Leadership Laboratory each week. As a freshman, you will learn Air Force basics, such as the role of the Air Force in the modern world, military customs and courtesies, as well as Air Force pay and benefits. As a sophomore, you will learn about the history of the U.S. Air Force. After completing your freshman and sophomore ROTC courses, you will compete to attend a four-week summer Field Training that offers you a firsthand look at the Air Force environment. During your junior and senior years, you'll complete the Professional Officer Course where you will study management principles, national defense policy and also manage, organize, direct, and evaluate the cadet wing activities. During Leadership Laboratory, you will learn about Air Force customs and courtesies, develop leadership and management skills and explore Air Force officer career opportunities. When you complete the ROTC program and receive your bachelor’s degree, you will be commissioned as a 2nd Lieutenant. The majority of our graduating officers (i.e. non-flying officers) serve a 4-year commitment on active duty. A handful of jobs, such as pilot, lawyer, and those in the medical field, may have a longer service commitment after graduation. You may be asking yourself, "What is Air Force ROTC and what does it have to offer me? " AFROTC offers many scholarship opportunities to help you pay for school, as well as a guaranteed job after graduation. The Air Force is always in need of new officers in a variety of career fields; prospective officers can choose from over 120 different jobs! Today's officers are offered cutting-edge technical training opportunities, advanced education, equal pay and promotions, 30 days of paid vacation a year, and an excellent retirement plan. Best of all, you have two years to decide if you want to commit to the Air Force or not; cadets incur no service commitment until they attend summer field training between their sophomore and junior years of school. Have any questions? Feel free to call us today at (713) 743-4932! Visit the Air Force Officer Career Fields web site.